East Harlem resident Raymond Tirado fears the zoning changes will make it difficult for him to stay in East Harlem after he retires. He asked the community board to vote against them in an upcoming meeting. 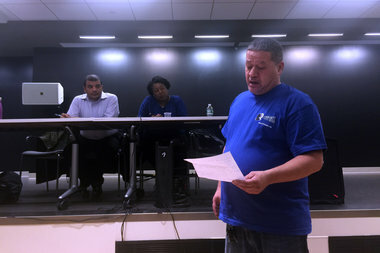 EAST HARLEM — El Barrio residents on Monday urged their community board to reject city-wide zoning changes aimed at increasing affordable housing, fearing that the changes would drive them out of East Harlem. The plea to vote against the changes to the city's zoning text — Mandatory Inclusionary Housing (MIH) and Zoning on Quality and Affordability (ZQA) — came during a public forum one week before Community Board 11 will vote on the zoning changes. Both proposed changes are part of the mayor’s plan to add 200,000 units of affordable housing in 10 years. As part of the change in zoning procedures, the city has to go through a public input process and ask each community board to weigh in on it. In Bed-Stuy, the local community board voted against both changes last week. In East Harlem, many senior residents criticized the changes for not requiring senior housing to be permanently affordable. Roughly 100 people showed up to the forum and all of the speakers in the open mic session asked the board to vote against the proposed zoning changes. “I’m about to retire and I want to retire where I’m at, where I’ve been living all my life which is Spanish Harlem,” said Raymond Tirado. Under ZQA change, senior housing would be affordable for a minimum of 30 years, with many city programs requiring 60 years, according to the Department of City Planning. Residents fear that as they retire and start depending on fixed incomes, higher rents could push them out. They would like to see more protections to avoid that possibility. “To have this not permanently affordable for seniors it’s an outrage because our population is getting older,” said resident Brody Enoch. The citywide zoning process changes are different than the city's proposed rezoning of East Harlem. The citywide amendments would change rules regarding what can and cannot be done after a rezoning. They would not create specific rezonings or developments, according to the Department of City Planning.